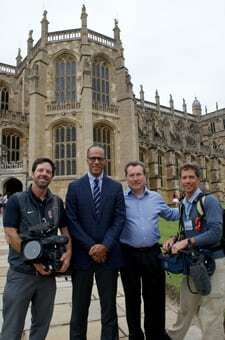 Television crews from the US company NBC have come to Windsor twice in the last ten days to film footage to give their Olympic broadcasts some feel for the United Kingdom as well as sport. Lester Holt, anchor of the NBC weekend ‘Today’ and nightly news programmes, was involved. He is seen outside the south front of the Chapel. 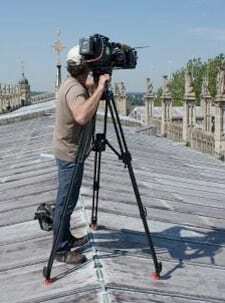 In addition to filming inside St George’s Chapel and in the Lower Ward the crew went onto the roof of the Chapel. The camera is seen pointing towards the Olympic and Paralympic Rowing and Canoeing venue at Eton Dorney.